As you know, I love Oprah and sometimes she says the funniest things. When she’s talking about how she’s scared to do something, she says, “I’m skird.” Pronounced like “scared”, but shorter and much funnier. So now she has me doing it, and I’m here to tell ya that I’m SKIRD to do one of these so-called Acrylic Albums. I keep seeing them everywhere I go (online). I glance, I look, I turn my eyes away in fear and embarrasment. There is no WAY my teeny weeny creative bone could complete an acrylic album without well and truly screwing it up. Because here’s the deal – and I know it will shock you – it shocked me too ——- the thing is SEE THRU!! I mean, how ya gonna hide the Herma tabs and the backs of staples and keep the image on one page from showing through to the other or do you even want to and, oh my God, my mind is just spinning! I look at the samples that are so FREAKIN beautiful and I just say, “Wha?? ?” and “How did she..?? ?” and “Well, I could never…”. So call me crazy, but I went ahead and ordered one anyway. (Everybody now! “Hiiii, Crazzyyy!!). We happen to have them right now at Memory Works on the page that carries the more seasonal stuff, i.e. once it’s gone, it’s gone and not necessarily restocked. I keep hearing about acrylic albums lately; they seem to be the latest craze. So while I might be too scared to actually DO anything with it, I figured I’d better order one before I regretted NOT doing it. KWIM? 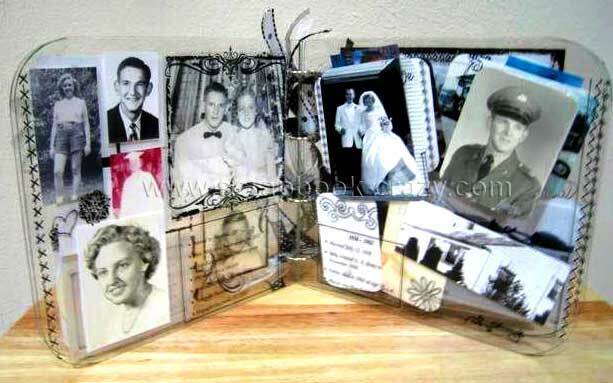 There is even a YOU TUBE VIDEO showing a very cool acrylic album by Tamarz from www.scrapbook-crazy.com – check it! So, have you taken the Acrylic Album plunge or will ya? If you have a pic of one you have completed, please link to it in comments and I’ll add it to my post. Me too! Me too! I’ve been so “afeared” (that’s one we use in our house) of doing one. Dude, I am not taking any more plunges until at least half of my current stash has been used. Nuh-uh, no way!!! I have a room full of stuff like you would not believe. Don’t be skird!! 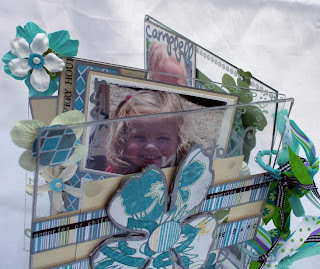 I took the leap myself by buying an acrylic album at CKC. We’ll see what I end up doing with it!! I’m “afeared” of making one, too, but I’ve purchased several, so am now sort of committed. I’ve started on the chipboard ones, and they’re so quick and easy. The ones I’ve seen as samples are AWESOME so I hope mine are ok. I guess “take the plunge” is my only hope! I just finished my first one- had no idea what I was doing, so attached the pictures to the front, instead of the back of each page! Oh, well…my daughter will still like it! I’ve since made so many that I’m sure my husband is thinking that he’s been over-run by my obsession! 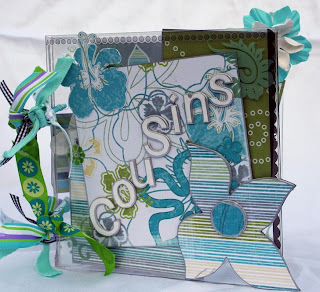 I absolutely love them, lots because it involves some planning to make sure you cover the back of each page with either another photo or embellishments, if your adhesive shows. They’re great if you either don’t have enough pics to warrant a whole regular 12×12 page or have an event that warrants its own book. My daughter and I went to see Phantom of the Opera and couldn’t take pictures, so I bought a fancy handbill and cut the pictures from it to use instead. It turned out so good! So need to be afeared anymore!